New vehicles at Fire Station 13. Photo courtesy of Lt. Kyle White. 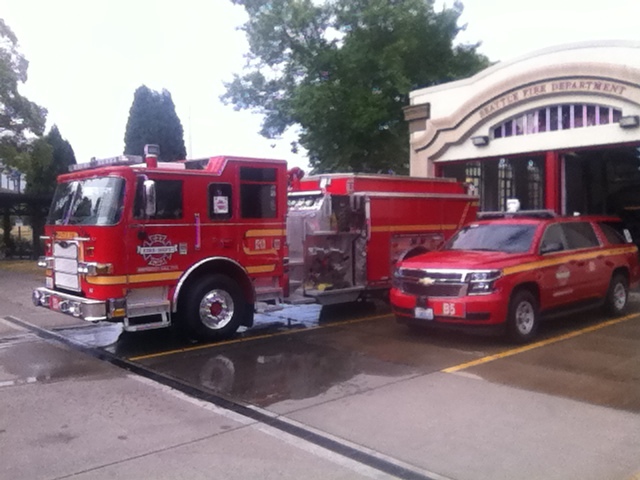 Lt. Kyle White of the Seattle Fire Department tells us that Fire Station 13, in the historic building on the corner of Beacon Ave. S. and S. Spokane St., took delivery of two new vehicles this month. They received a 2015 Pierce fire engine that went into service on June 11. It replaces a 2003 American LaFrance that has been relegated to reserve status and will be housed at a fire station in Wedgwood. Earlier in the month, the station also took possession of a 2015 Chevy Suburban that will operate as a battalion chief’s vehicle. Previous PostCheck out the CommonsNext PostFree movies this summer!